The bi-annual China Job Fair for Foreigners is approaching once again, and this time it’s better than ever! Sponsored by ChinaJobs (of the Chinese government State Administration of Foreign Expert Affairs), and with hundreds of employers and thousands jobs to choose from, you would be crazy to miss out. The fair offers all kinds of work opportunities – full time, part time and internship. This is a great chance to meet employers and find new opportunities in a friendly, informal environment set up specially for putting employers and job seekers together. The event will be hosted in multiple cities simultaneously, so no matter where you are you should be able to attend somewhere local to you. 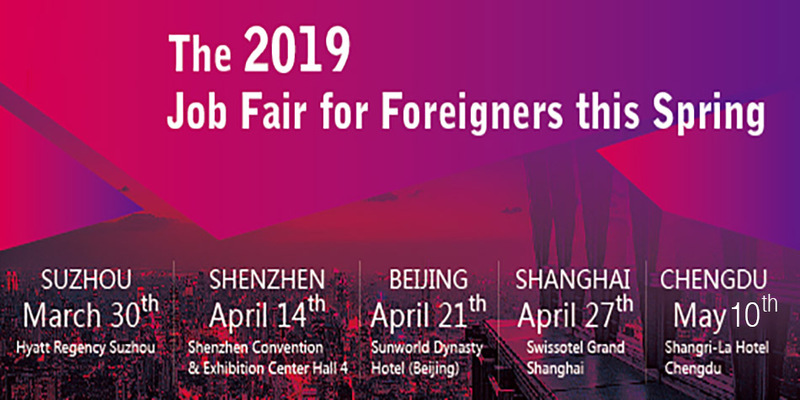 This Spring 2019, the National China Job Fair for Foreigners will be held in 5 cities in China. Here are a few tips to make your Job Fair visit more successful. The event is an informal setting, but you should still approach it with some level of sensibility. First impressions count! Take some paper copies along with you, and be prepared to provide a digital copy too, perhaps via USB or Wechat. Paper is nice because employers can directly write notes on it, but everyone also wants a digital copy for their records. You may have heard of the ‘elevator pitch’, a quick sales pitch aimed at defining a product or service and its value in a minimum amount of time. You should consider doing similar for yourself. Think about how best to introduce yourself, your skills, your experience, and what you can bring to a company. It's free of charge of Job Seekers, register here!